Bristles are stain resistant as well as resistant to most oils, solvents, fungus and bacteria. 12" sweeping path for reaching into corners and along baseboards. Snap-on dust pan for convenient storage. 48" handle with comfort grip. 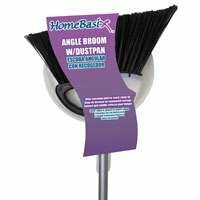 8-1/2" polypropylene dust pan clips onto broom handle. If you have any questions about this product by Homebasix, contact us by completing and submitting the form below. If you are looking for a specif part number, please include it with your message.